"I just received the Jinhao Purple Celluloid. I don't know that I would call it Purple, then again, depending on the light, I don't know that I wouldn't. 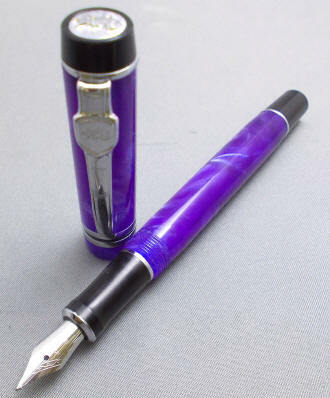 Blue or purple, I was surprised to find that the smaller nib wrote as smoothly as the larger one. It's a spiffy looking pen whatever the color." "Norman -- Many thanks for the Jinhao pen. I love it, and I am glad that I was able to purchase the last one in stock. The nib writes well (it's smooth and very well-adjusted). I do want to purchase a Jinhao 159 when those pens become available, so I'll keep checking the website and your email updates for such availability. I hope all is well and that you are enjoying autumn." I found it difficult to capture the true beauty of this pen's material in a photograph. It's a combination of pearlescent purples and gray/white. It's a mid-size pen (although full-sized if posted), measuring 5-1/4" capped, 6-3/8" posted and 4-3/4" with cap held aside. 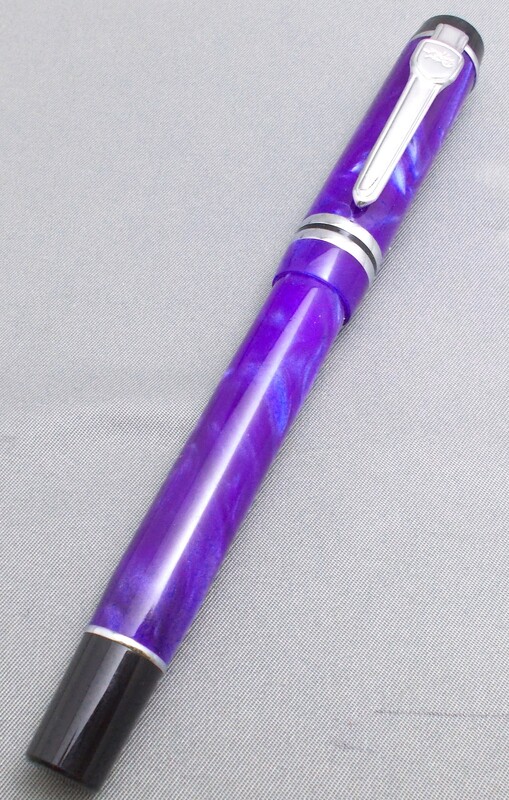 It's overall design is reminiscent of the Parker Duofold International, for those of you familiar with that pen. It's surprisingly rare (because they're very popular, in my experience) to find a true purple pen. This one qualifies. Jinhao's sword and shield clip obviously differentiates the pen from the Parker, with it's arrow clip -- and the Jinhao chariot logo adorns both the shield and the cap top (here, in high relief). 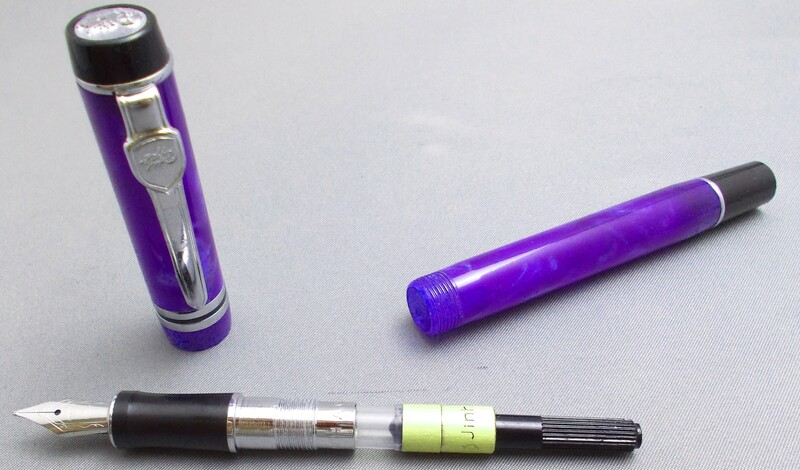 The pen employs a screw-cap, which is posts through friction. 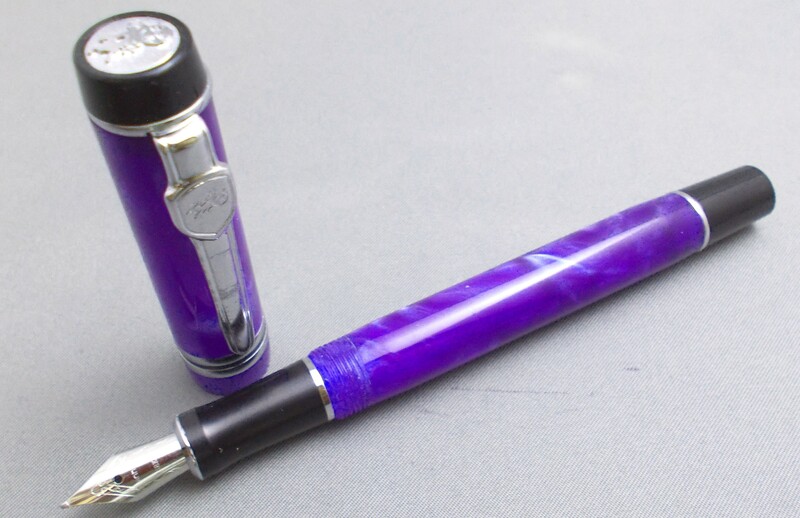 The pen's section is is slightly concave in the center, which makes for a very comfortable and secure grip. The 18K gold-plated steel nib is engraved with Jinhao and 18KGP and which I would rate as a fine-medium', meaning that it falls on the finer end of a typical western medium. Unscrewing the threads between the section and barrel displays the piston converter for bottled ink. It will also take International-style cartridges, such as those from Private Reserve. As with all new pens, I recommend to run a dilute solution of dishwashing soap (two or three drops to a small bowl of water) through a new pen a few times, followed by water only. Step one is effective at removing manufacturing oils that can tend to make the ink less than enthusiastic in heading from the converter/filler to the nib, and step two removes the traces of the detergent you've used...which tends to have the opposite, diuretic effect. A gift box is included.